Earlier this week I stumbled across a surprisingly on-target quote about what got us into this economic mess from, of all people, Treasury Secretary Timothy Geithner. The failures that led to this financial crisis were many. Banks and investors took on large risks, risks they did not understand. Washington allowed those risks to build up unchecked. And in communities across the country, Americans borrowed too much in part because they did not understand how to save prudently, how to borrow responsibly, and they did not understand fully that pension values and house prices, equity prices will not always rise. It’s not a perfect explanation. I wouldn’t make the general statement that banks and investors didn’t understand the risks they were taking. Some didn’t, but many understood quite well. And I think Washington was more than a passive observer of the whole mess. But the blame laid at the feet of Wall Street and the government is mostly pro forma here. What Geithner is saying is that, as it turns out, a widespread lack of financial acumen amongst ordinary folks was at least as damaging as the foolishness amongst the bankers and bureaucrats. In the immortal words of Pogo "We have met the enemy and he is us." Welcome to the club, Tim. Politely ignoring the gap between an increasingly sophisticated economy and the capabilities and knowledge of the typical consumer will not make the problem go away. Certainly, it is hard, particularly for government officials, to blame ordinary people, i.e. voters, for much of anything. For example, the irresistible bias in the media and elsewhere is to consider those that borrowed more mortgage than they can now pay back to be the victims and the faceless corporations who are getting stiffed as the villains. I am not suggesting a reversal that black-white dichotomy. I prefer gray: both borrower and lender screwed up. But believing, as many people do, that consumers cannot possibly be held responsible for a bad mortgage because it is the lender’s, and only the lender’s, job to determine if a loan can be paid back, ought to be considered absurd. Instead, it is taken seriously. When you get down to it, the problem is not just that many Americans do not understand personal finance as they should. It is the widespread attitude that it is unreasonable to expect Americans to understand personal finance as they should. You see this in, for example, the enthusiasm for opt-out schemes for 401(k) plans. Obviously, ordinary workers don’t understand the importance of saving. Rather than waste effort trying to explain it to them, just put them in the plan by default. Well, it seems that the mandarins in the Obama administration have had something of a change of heart. Perhaps the ordinary folk can be educated after all. The Geithner quote is from a newly announced effort to introduce personal finance into high school curricula. I am not especially optimistic about this program. If nothing else, I am deeply skeptical that the people who are developing the curriculum, and the teachers who will have to teach it, understand enough about personal finance themselves. But it is a start. They say the first step is acknowledging you have a problem. It is also necessary that you believe that there is something you can do about it. >unreasonable to expect Americans to understand >personal finance as they should. You see this >in, for example, the enthusiasm for opt-out >schemes for 401(k) plans. 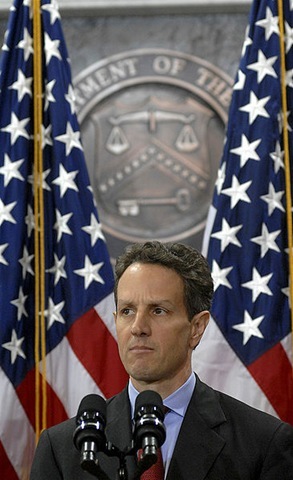 Calls for Geithner’s resignation expected in 3…2…1. Seriously, for someone in the political realm to suggest that the little guy might share some responsibility in all this is pretty much a career ender. I actually agree in something Geithner says? Did a solar eclipse just happen? Seriously though, personal finance education, or the serious lack thereof, has been my biggest beef with our lovely education system. They will teach you things that you’ll never use in day-to-day living, but yet don’t have basic financial education part of required curriculum. Something that you DO interact with on a daily basis – money. Mind you I’m not expecting Warren Buffet protegees, but at least the basics. I am sure of that one. It’s not just that we made mistakes in the mortgage area, though. The mistakes we made re mortgages relate to big flaws in our understanding of the risks of overvaluation. Those same flaws apply in our understanding of how stock investing works. The stock problem is the bigger problem. It all comes down to our mistaken confidence in the Buy-and-Hold Model. It really was a mistake, not something done to us with deliberate intent. I think it would be fair to say that a good bit of the cover-up was done with at least some deliberate intent, however. This all should be discussed out in the open by all interested parties and that has not yet even begun to happen in any serious way. I am hopeful that 2010 will be the year. There’s tons of wonderful stuff on the other side of The Black Mountain. That’s the other side of the story. The governments make laws. In modern business law, banking regulations, and taxation, the government is reaching out into many aspects of behavior that have no absolute truth. (Differs from criminal law, where much resembles “You shall not kill” in that they’ve codified the principles agreed upon by the masses for centuries.) For a government of such complexity, with laws so thorough and detailed, influence shows in every decision of every company and every person. It’s hard for me to blame companies here. They’re legally required to pursue profits for shareholders. We know they’re going to push the limits set by the government; we know they’re going for every dollar people have. After all, it’s only with a GREAT deal of cynicism, bordering on anxiety, that some of us manage to submit myself to thousands of advertisements in a day without spending more than we have. We all *could* blow every dime in our possession within a few days, right? So it’s a matter of personal responsibility to know how companies act and not trust someone working for your money. Which brings us back to our beloved government: they need to be held responsible for the frequent mistake of trusting companies to do the right thing. Lawmakers should know better, as the lobbying on behalf of businesses has handed our lawmaking process to corporate interests. They need to be held responsible for representing the people, and they need to fully realize that it is NOT an acceptable shortcut to listen to corporate interests who claim to represent consumers. Economic growth is the government’s chronic addiction; there are too many lawmakers who think listening to corporate interests will grow the economy. WOW! I’ve been recommending education on financial matters for years. Demanding more regulation won’t work because bankers will always be able to figure out some new trick to make money, but teaching students about general finance so that they understand what they are getting into should at least be tried. So, if you are saying that just like stocks, we need be ready to sell our homes if market conditions (valuations) get ahead of themselves (a bubble) and to buy real estate when only it is a bargain, then I’d just ask how that technique is working out for you? It seems that you staked your retirement on the value of your home rising continuously, yet you failed to sell it either before, during or after the peak, so one wonders what you are doing to earn income now, since your savings could not sustain your withdrawal rate, when last you spoke to such matters publicly. I noted that you did put it on the market for roughly three or more times what you paid for it, but obviously had no takers, since by then the bubble had burst. How is it that you intend to take money out of the home, as referenced in these two articles regarding your personal plan? Rob’s investment Web site, Passionsaving.com, hasn’t taken off the way he’d hoped. That’s a problem, because the Bennetts had been counting on the extra income to help pay for the college educations of their two home-schooled sons, now 7 and 9. “It’s not like we don’t have the money to get by day to day,” Rob said. “But that’s a dark cloud on the horizon.” So Rob is considering his options, including a possible return to the corporate world and steady pay. “I have to do something else at some point,” Bennett said. I don’t know that Rob ever explained how he was going to extract 2% per year out of his home, nor what type of job he hopes to get now that he has been out of the job market for a decade. Frankly, many out there consider Rob Bennett to be a cautionary tale of how NOT to retire early. It would be great if there were an easy way to do that, Fix. Our homes are a combination in economic terms — they are part personal consumption (the enjoyment we experience not getting hit by raindrops) and part investment (the enjoyment we experience when prices go up). Yes, it would absolutely be a good idea to own less home when homes are overpriced and to own more home when homes are underpriced. It’s hard to do that with a home, of course. It’s easy to increase or lower your stock allocation in response to big price changes. It’s a pain to do with your personal residence. One angle worth considering here is that, if we all did it with our stock portfolios, we would probably never see huge overpricing in the housing market again. The housing bubble was fueled by the insane stock bubble (which was caused by the popularity of the Buy-and-Hold “idea”). If we do away with stock bubbles (by doing away with Buy-and-Hold), we probably would be doing away with housing bubbles too. And. yes, the reason why I put my house up for sale is that the housing bubble had grown so great in my area that it became worth the trouble to go through all the hassle of moving to be able to take advantage of the mispricing. We weren’t able to sell in time to take advantage; prices have now dropped to more reasonable levels. But we came close and it obviously would have been a huge financial gain for us if we had been able to take advantage. I certainly don’t regret giving it a try. You sound hostile in some of your comments, Fix. I view that as a bad sign. You might want to think over a bit why the subject of overvaluation causes you such emotional distress. When you get too emotional about investing decision, that holds you back. Or at least that is my sincere take re the matter. I agree that many people made mistakes in over-extending themselves. However, I do think that even if individuals had shown restraint, the banks would have simply found something else to do to make money. It’s what they do. And the negative impact of their efforts seems to be in large part because they are extended so much leverage. Had that been lower, the fall wouldn’t have hurt as much.